When considering a loss on drying moisture meter, it is important to consider the idea that it is a primary measurement method. This means that it can measure the amount of liquid in nearly anything, without any kind of calibration. 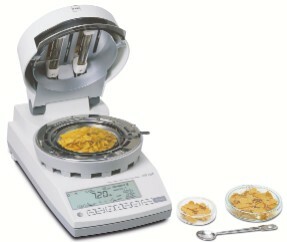 This is also the very first method for measuring the amount of moisture a subject contains. A new kind of moisture meter has emerged in the past few years, known as a near infrared (NIR) moisture meter. After a quick calibration, the NIR moisture meter measures the surface level of moisture, by reading how much light is reflected back to the NIR meter, making it a secondary measurement method. They’re really a very exciting development in the world of measuring moisture content with lots of functions and nearly instant readings. Time Requirements: If time is no concern, you may be able to consider a LOD moisture meter, which can sometimes take upwards of 30 minutes for the subject to completely dry in order to get an accurate reading of the level of moisture. However, no calibration is needed. NIR moisture meters can be much more instantaneous, only requiring a quick calibration, and then giving almost instant results. Accuracy: Both meters have their definite strengths, and a few drawbacks in terms of providing accurate readings of moisture levels. LOD meters are able to take moisture readings of samples with very high levels of moisture, but operator error can lead to inaccurate readings. Additionally, all volatiles are evaporated during the drying process, so moisture levels reflect all liquids, not just the water content. LOD meters operate on the assumption that all liquids present in your sample are water. NIR moisture meters are able to determine the level of many kinds of substances, including fats and oils and sugars, depending on how the meter is calibrated, and can be used to take moisture levels in both liquids and solids. Something to consider, however? NIR meters only take the moisture level at the surface. If you are concerned about your sample having different moisture levels throughout, you may need to consider a LOD meter. Otherwise, NIR meters, once calibrated, are highly accurate and nearly insusceptible to operator error. Portability: If a need for portability is a concern, then your only real choice is a NIR sensor. NIR moisture meters come in handheld, desktop, and in-line versions, while LOD drying ovens can be large and bulky, and not something that can really be taken out into the field for a reading. NIR meters are much smaller, and many are designed specifically with portability in mind, and are even battery powered. Industries: LOD moisture meters are commonly used in the food industry, in pharmaceuticals, in pulp and paper, and in chemical companies. What do all these industries have in common? They are usually very controlled environments, where a general knowledge of the composition of the sample already exists. NIR moisture sensors are used in food and grain processors, the tobacco and pharmaceutical industries, with pulp and paper, minerals, personal care products, chemicals, and textiles. Their use is more widespread because of the flexibility and portability an NIR moisture meter affords. Other Factors to Consider: For starters? In choosing a moisture meter, you need to determine if your moisture meter should be destructive or non-destructive. Because they require an entire sample to be totally dried, LOD moisture meters are destructive; the sample is no longer viable for use. The NIR moisture meter, however, is non-destructive, and does not require the drying of the sample in order for an accurate reading. Another factor to consider is cost. LOD moisture meters can start small, around $2,000, with larger, more complex meters running around $15,000. For NIR meters, the price starts around $10,000, and can run upwards of $40,000. While both sensors are definite investments, the information that they provide can really become a priceless part of your manufacturing, packaging, or harvesting process. If you need more assistance determining which moisture meter is right for you, don’t hesitate to contact us today. The team at Kett is passionate about our products and happy to share knowledge with you in order to help you find the exact right moisture meter for you.